Magnetite is a ferromagnetic mineral with the chemical formula Fe3O4and the common chemical name ferrous-ferric oxide, which indicates the mineral comprises both a ferrous component, FeO (wüstite), and a ferric component, Fe2O3 (hematite). Magnetite is one of several types of iron oxide and its official (IUPAC) name is iron(II,III) oxide. It is a member of the spinel group of minerals, which crystallize in cubic and octahedral patterns, and its crystals are black and opaque. The most magnetic of all naturally occurring minerals on Earth, magnetite occurs in some places as naturally magnetized stone called lodestone and was used as an early form of magnetic compass. Magnetite dissolves slowly in hydrochloric acid. Magnetite mineral is valuable as an iron-bearing ore. In addition, as it carries the dominant magnetic signature in rocks and it tends to lock in the magnetic pattern it carried as it was last hardening, magnetite has played a critical role in understanding plate tectonics. Changes in the oxygen content of the Earth's atmosphere can be inferred by studying sedimentary rocks containing magnetite. Moreover, interactions between magnetite and other oxide minerals have been studied to determine the oxidizing conditions and evolution of magmas over geological history. Small grains of magnetite occur in almost all igneous rocks and metamorphic rocks. Magnetite also occurs in many sedimentary rocks, including banded iron formations. In many igneous rocks, magnetite-rich and ilmenite(a titanium iron oxide)-rich grains occur that precipitated together from magma. Magnetite occurs in many sedimentary rocks, and huge deposits have been found in banded iron formations. In addition, this mineral (especially in the form of small grains) occurs in almost all igneous and metamorphic rocks. Many igneous rocks contain magnetite-rich and ilmenite-rich grains that precipitated together from magma. 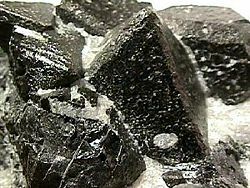 Magnetite is also produced from peridotites and dunites by serpentinization. Magnetite is sometimes found in large quantities in beach sand. It is carried to the beach by the erosive action of rivers and is concentrated by waves and currents. Such mineral sands (also called iron sands or black sands) are found in various places, including beaches in California and the west coast of New Zealand. In June 2005, an exploration company (Candero Resources) discovered a vast deposit of magnetite-bearing sand dunes in Peru, where the highest dune is more than 2,000 meters (m) above the desert floor. The dune field covers 250 square kilometers (km²), and ten percent of the sand is magnetite. Large deposits of magnetite have been found in Kiruna, Sweden, and the Pilbara region of Western Australia. Additional deposits occur in Norway, Germany, Italy, Switzerland, South Africa, India, and Mexico. In the United States, it is found in the states of New York (Adirondack region), New Jersey, Pennsylvania, North Carolina, Virginia, New Mexico, Colorado, Utah, and Oregon. Crystals of magnetite have been found in some bacteria (such as Magnetospirillum magnetotacticum) and in the brains of bees, termites, some birds (including pigeons), and humans. These crystals are thought to be involved in magnetoreception—the ability to sense the polarity or inclination of the Earth's magnetic field—and to aid in navigation. Also, chitons have teeth made of magnetite on their radula, making them unique among animals. This means they have an exceptionally abrasive tongue with which to scrape food from rocks. The study of biomagnetism began with the discoveries of Caltech paleoecologist Heinz Lowenstam in the 1960s. Magnetite can be prepared in the laboratory as a ferrofluid using the Massart method. It involves mixing iron(II) chloride and iron(III) chloride in the presence of sodium hydroxide. This mineral is the most magnetic of all known naturally occurring minerals. Its Curie temperature is about 580°C. Chemically, it dissolves slowly in hydrochloric acid. The interactions between magnetite and other iron-rich oxide minerals—such as ilmenite, hematite, and ulvospinel—have been studied extensively, as the complicated reactions between these minerals and oxygen influence how magnetite preserves records of the Earth's magnetic field. Igneous rocks commonly contain grains of two solid solutions: one between magnetite and ulvospinel, the other between ilmenite and hematite. A range of oxidizing conditions are found in magmas, and compositions of the mineral pairs are used to calculate how oxidizing the magma was and the possible evolution of the magma by fractional crystallization. ↑ 321Gold, Ferrous Nonsnotus. Retrieved September 12, 2007. Chang', Shih-Bin Robin, and Joseph Lynn Kirschvink. Magnetofossils, the Magnetization of Sediments, and the Evolution of Magnetite Biomineralization. Ann. Rev. Earth Planet. Sci. 17:169-95, 1989. Retrieved September 12, 2007. Klein, Cornelis, and Barbara Dutrow. Manual of Mineral Science. 23rd ed. New York: John Wiley, 2007. ISBN 978-0471721574. Lowenstam, Heinz A., and Stephen Weiner. On Biomineralization. New York: Oxford University Press, 2003. ISBN 0195049772. Mindat.org. Magnetite. Mindat.org, 2007. Retrieved September 12, 2007. Mineral Gallery. The Mineral Magnetite. Amethyst Galleries, 2006. Retrieved September 12, 2007. This page was last modified on 7 August 2018, at 18:11.